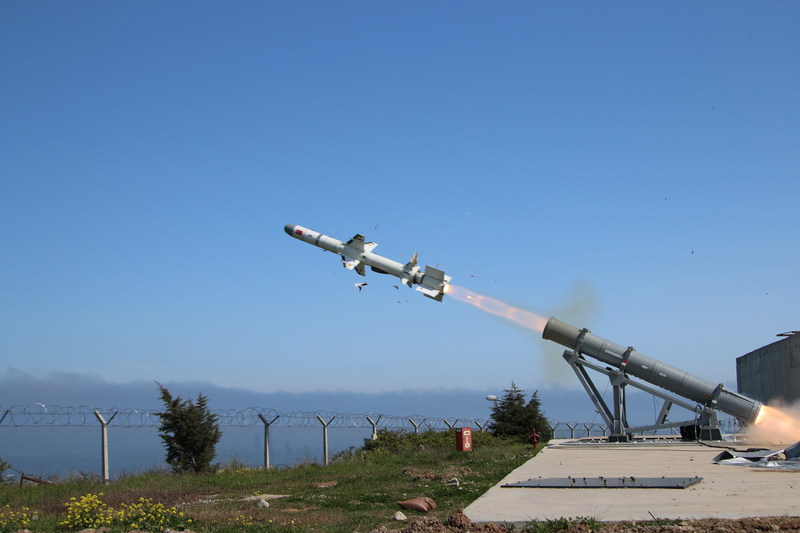 A test firing of Atmaca missile. Date unknown. On 2nd November 2018, The Presidency of Defence Industries –former Undersecreteriat of Defence Industries- the main defense acquisition agency of Turkey announced that a contract for the serial production of Atmaca (Hawk) anti-ship missile was signed. The contract was signed between PDI and Roketsan the leading company in the country for designing, developing and manufacturing rockets and missiles, as the main contractor. Aselsan the main defense electronics company is acting as sub-contractor and providing the RF seeker head and guidance section. Since its start, the Atmaca Project has always been shrouded by thick layers of secrecy. And this habit continues still. Neither the value of the contract nor the number of missiles to be procured was revealed. The scheduled commissioning date of the missiles was also not made public. The press release about however mentioned that the first missiles are to be installed on board of the TCG İstanbul. TCG İstanbul is a İ class frigate currently under construction in Istanbul Naval Shipyard. The Turkish Navy conducted another sinking exercise SINKEX last week on 17th October. This is the second SINKEX Turkish Navy has conducted in 2018 and the third, in the last 12 months. This exercise was not previously announced. But it was anticipated since the decommissioned navy tanker ex- TCG Taşkızak was observed being towed to the Black Sea on 16th October 2018. The previous sinking exercises were also conducted in the Black Sea. The tanker sunk in 5 minutes 36 seconds after the impact of the torpedo. 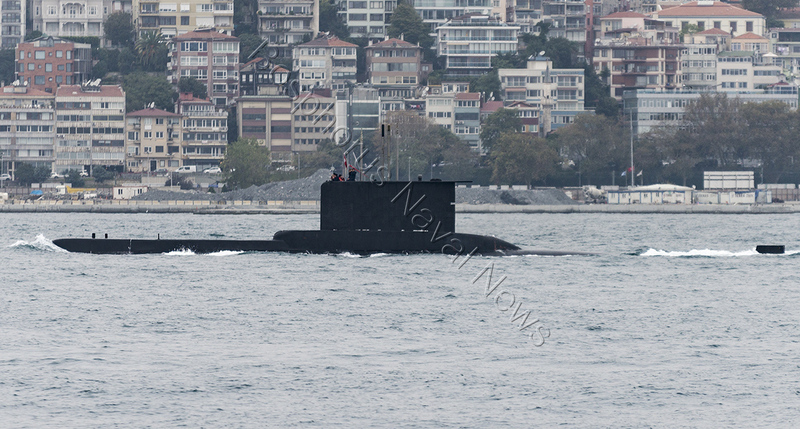 Istanbul on 19th October 2018 was most probably the submarine that fired the torpedo that sunk the ex- TCG Taşkızak during the SINEX. 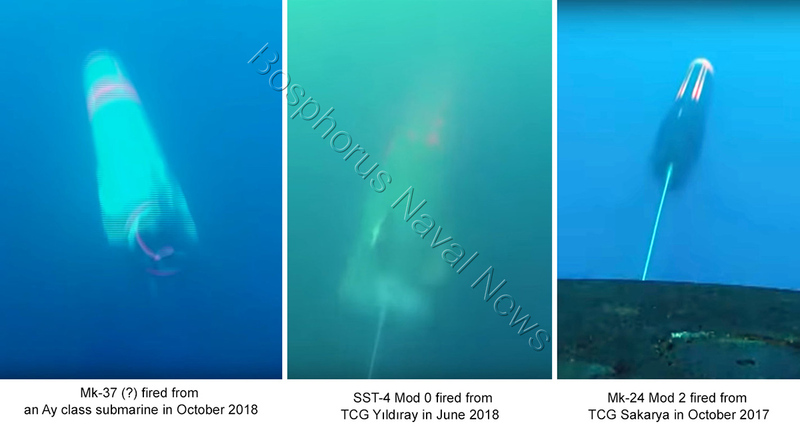 The short video of the exercise, shows an unguided torpedo being fired from an Ay class submarine. The torpedo seems shorter than contemporary modern torpedos and does not have a guidance wire. Therefore I believe it was an Mk-37 torpedo. The legacy DUBM 20B sonar system on board of TCG Edincik, here off Istanbul in 2017, was replaced by indigenously developed MATESS system. 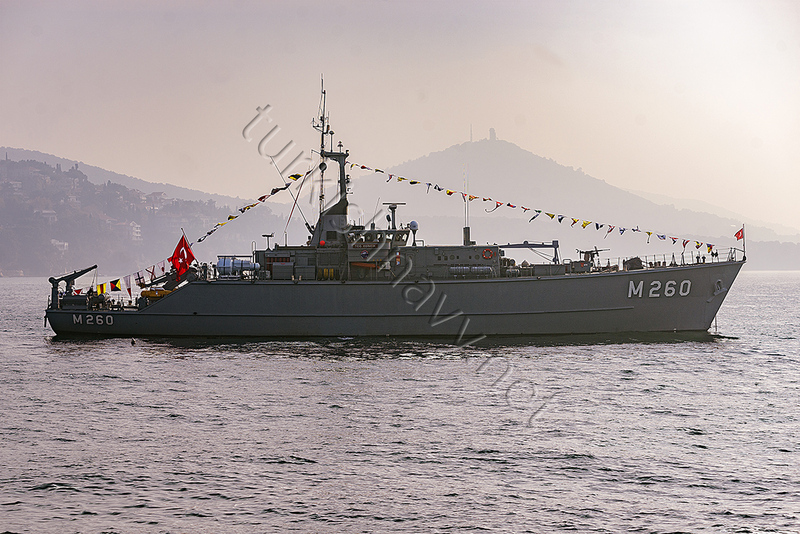 It was revealed during the industry day of the Nusret 2018 mine warfare exercise, that the Turkish minehunter TCG Edincik was fitted with the mine detection sonar of Aselsan. Aselsan started to development of MATESS, mine detection sonar as a private project without a firm order from Turkish Navy. When the system was evolved to certain maturity, it was installed on board of Edincik class minehunter TCG Edincik. The minehunter started her life as FS Calliope in 1971 in French Navy. In 1999 she and her 4 sisters were bought by the Turkish Navy. 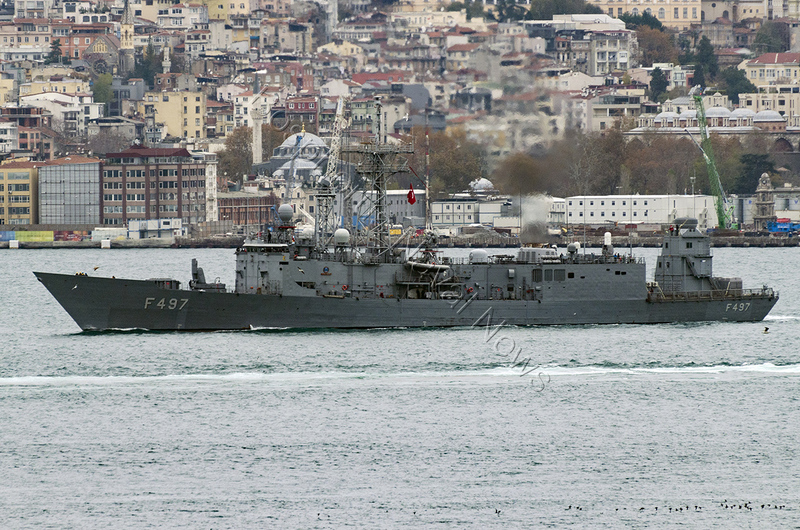 She was renamed as TCG Edincik and transferred in 1998. In her original configuration, she was fitted with DUBM 20B minehunting sonar. According to Aselsan MATESS is a mine detection and object avoidance sonar, providing automatic detection, localization and classification capability for underwater objects, supporting ships navigation safety at high reliability. The system is made up from the transducer array, transmitter and receiver, signal processing and user interface units. Aselsan expects the testing of the sonar system on TCG Edincik will end in late December and in early 2019 the system will officially be inaugurated to Turkish Navy. 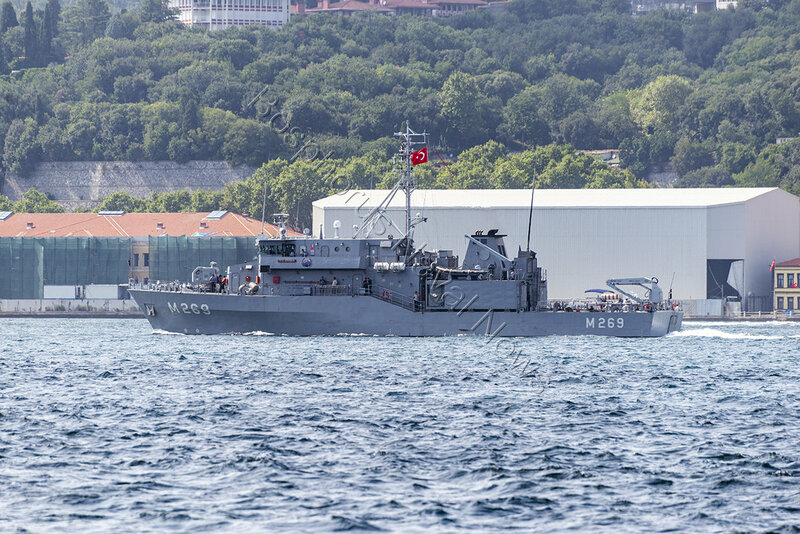 Her attendance to the Nusret mine warfare exercise should be regarded as a part of the testing and evaluation process of the MATESS by Turkish Navy. 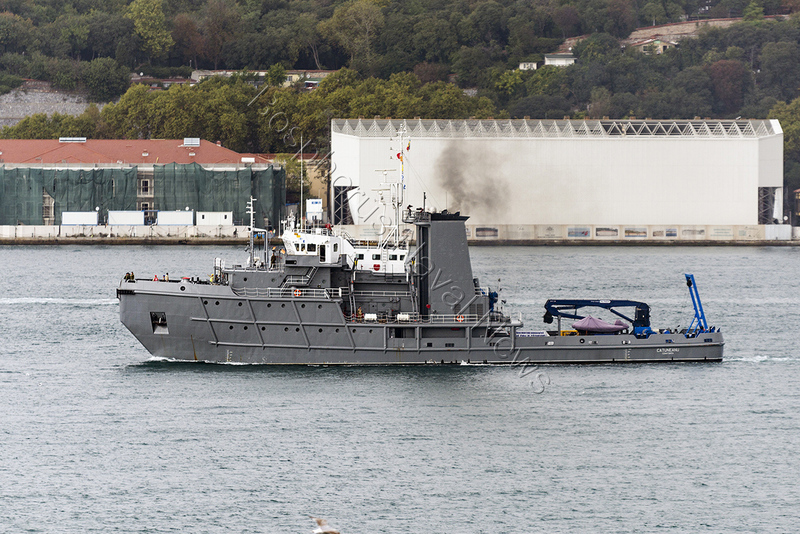 The Bulgarian mine hunter BNG Tsibar, seen here passing southbound through Istanbul on 10th October 2018 takes part in Nusret 2018 MCM exercise. The Romanian hydrographic research vessel Cătuneanu is participating to the Nusret 2018 exercise too. Here is she seen passing through Istanbul on 13th October. Mine warfare exercise Nusret 2018 has started in İzmir today. 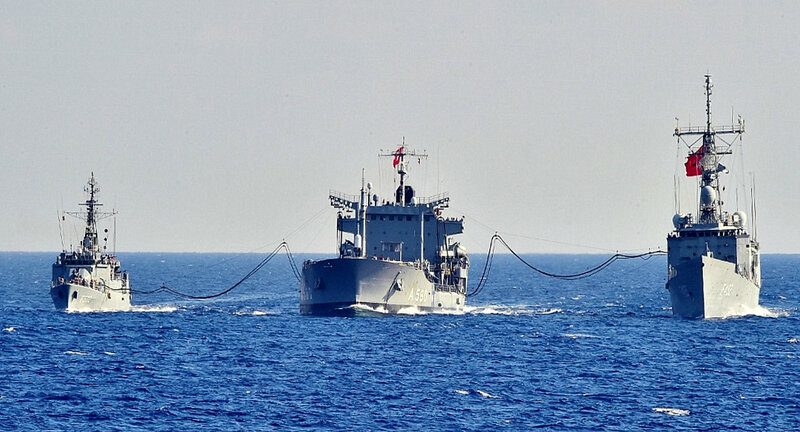 The exercise led by the Turkish Navy aims to provide training for the planning and execution of mine warfare and to improve the interoperability in mine warfare, between warships from participant countries. The exercise is named after the famous minelayer Nusret. In even years the exercise is held in İzmir Bay and in odd years it is held in Çanakkale and Saros Bay. This year 18 surface units including 4 Aydın class minehunters, 3 Edincik class minehunters, one minelayer, one corvette and one patrol boat from Turkish Navy, Standing Nato Mine Warfare Group 2 (SNMCMG-2) and Romanian hydrographic research ship are participating in the exercise. A detailed list of the participating units is at the bottom of this post. One Turkish and one Romanian autonomous underwater vehicles teams and one Greek and one Romanian underwater explosive ordnance disposal units are also taking part in Nusret 2018. The exercise has 3 phases. The first phase is the assembly of the participating units in the Port of İzmir. Followed by mine laying operation from one Turkish C-130 cargo plane and L-402 TCG Bayraktar. This phase is followed by active mine hunting warfare operations. The last phase will be a Photex of the participants and social and cultural activates among the crews to foster cooperation and mutual understanding. Mavi Balina (Blue Whale) 2018 invitation naval exercise is going to end today with a post-exercise briefing in Aksanz Naval Base in Marmaris. Mavi Balina is a biannual anti-submarine warfare exercise where the participating units had the opportunity to increase their readiness for actual submarine warfare operations. 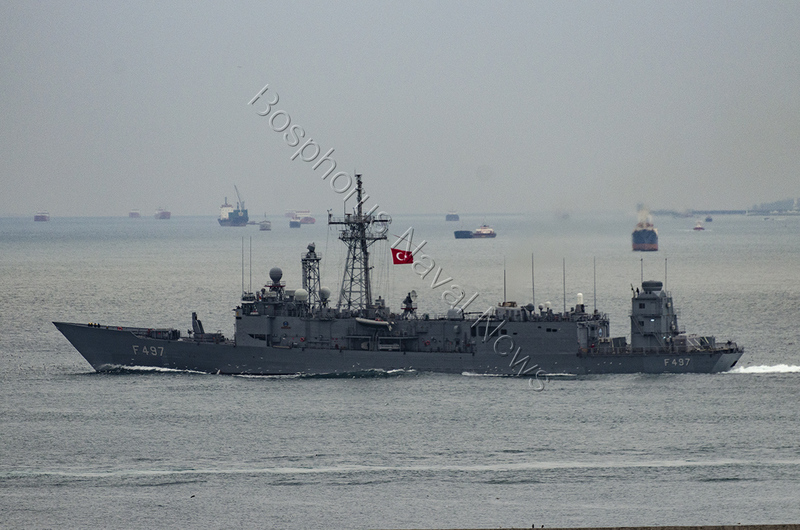 Romanian frigate ROS Regele Ferdinand seen here passing through Istanbul on 25th September 2018. She is going to take part in Mavi Balina Exercise. Mavi Balina (Blue Whale) 2018 invitation naval exercise will be held between 28th September and 7th October in the eastern Mediterranean. Turkish Navy will host ships, airplanes, helicopters, boarding teams and observers from, Algeria, Azerbaijan, Bahrain, Qatar, Kuwait, Pakistan, Romania, Saudi Arabia and the United States of America. Furthermore Standing NATO Maritime Group Two (SNMG2) will take part in the exercise too. Mavi Balina is a biannual anti-submarine warfare exercise. Participating units will have the opportunity to increase their readiness for actual operations and to increase their ability to perform joint operations. Turkish Navy will participate with 4 frigates, 5 submarines, 2 corvettes, 1 replenishment ship, 1 patrol boat 3 maritime patrol planes, and 6 helicopters. Airplanes from Turkish Airforce will also take part. NATO Maritime Group Two will deploy the flagship The Dutch frigate HNLMS De Ruyter, the Spanish frigate ESPS Cristóbal Colón, the Greek frigate HS Elli and one yet undisclosed Turkish frigate. Pakistan will join with the frigate PNS Saif and one maritime patrol plane. Romania will deploy the frigate ROS Regele Ferdinand and one helicopter. One maritime patrol plane from US Navy will take part in the exercise too. 18 visit, board, search, and seizure (VBSS) team members and 7 VBSS trainers from Azerbaijan are going to take part in Mavi Balina exercise. Their training will be evaluated by 3 men strong VBSS audit and evaluation team from NATO MARCOM. TCG Bayraktar during her acceptance test in 2017. She seems to have become the de facto training ship of Turkish Navy. On 3rd September the second year cadets of Turkish Naval Academy boarded TCG Bayraktar for a 20 day training cruise in the Black Sea. 318 Turkish students and 7 guest students from South Korea, Albania, Senegal, Turkish Republic of Northern Cyprus and Azerbaijan will sail through the Black Sea and visit Varna Bulgaria, Poti Georgia, Trabzon Turkey. TCG Bayraktar seems to be the favorite training platform of the Turkish Navy replacing the old Rhein class ships TCG Cezayirli Hasan Paşa and TCG Sokullu Mehmet Paşa. 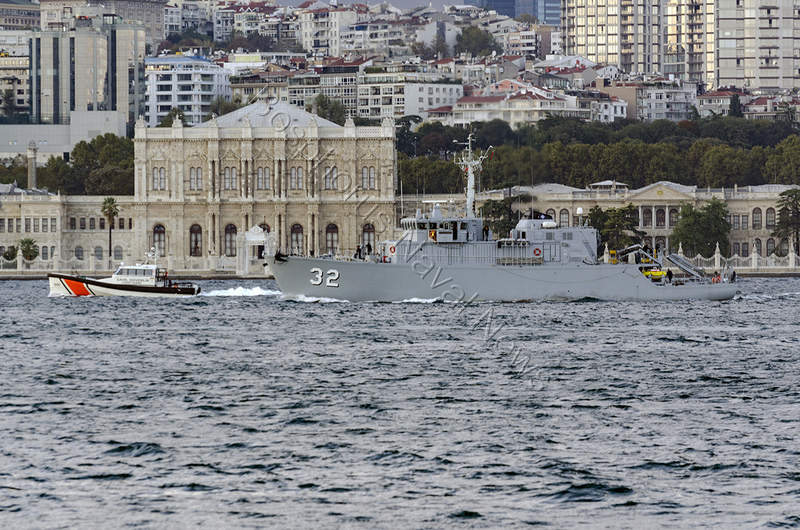 These two ships, initially built as tender for Germany Navy were transferred to Turkish Navy in 1980’ies. In Turkish service, they are mainly used as used for training cruises of Turkish Naval Petty Officer Vocational School and Turkish Naval Academy. Besides training cruises, both ships are used in flagships duties. But for the last two years, TCG Bayraktar was deployed for the training cruises. While I can understand why TCG Bayraktar is now the chosen platform for the training cruises. She is landing ship with a capacity to carry 350 persons. She has an 1100 square meter closed parking area and a 690 square meter large open deck. So there is enough place for the cadets to live and to train. TCG Bayraktar has modern command and control facilities, advanced damage control systems and weapons. So she is an effective platform to teach the cadets and show them how to live and fight on ships. TCG Bayraktar is a convenient platform for training unfortunately not the most representative one nor were the Rhein class ships. Turkish Navy needs a dedicated training ship. And I would like it to be a sailing ship. Almost one decade ago, in December 2008, the Defence Industry Executive Committee approved the commencement of training ship project. On 29 January 2009, Undersecretariat for Defense Industries issued a request for information (RfI) document about schooner type ships. But nothing since then happened. For some years the project was listed in the official presentations of UDI under the future acquisition projects. Now they even don’t do that. I have no doubt that nobody in Undersecretariat for Defence Industries or in Turkish Navy is talking about this project anymore. I personally STILL look forward to seeing these schooners in service. I believe that only sailing can teach a young and aspiring sea cadet about the forces that will shape his/her life in the coming twenty-thirty years. There is no better way than sailing and challenging the elements, in order to develop good ship handling skills and a feeling for the sea. Today’s naval warfighting has become something like an arcade game. All command, control, and communication are done in the bowels of the ship. Yet a commander of any warship must be a sailor first and bring the ship back to the port safely. I can not think of a person who would not be impressed by seeing a tall ship sailing into their port. TCG Bayraktar is a large piece of grey steel lump, impressive but unimaginative. In terms of naval soft power, these schooners will a force multiplier for the Turkish Navy when and if they enter into the service. The flagship of Standing NATO Mine Countermeasures Group Two FGR Rhein, during her southbound transit through Istyanbul. 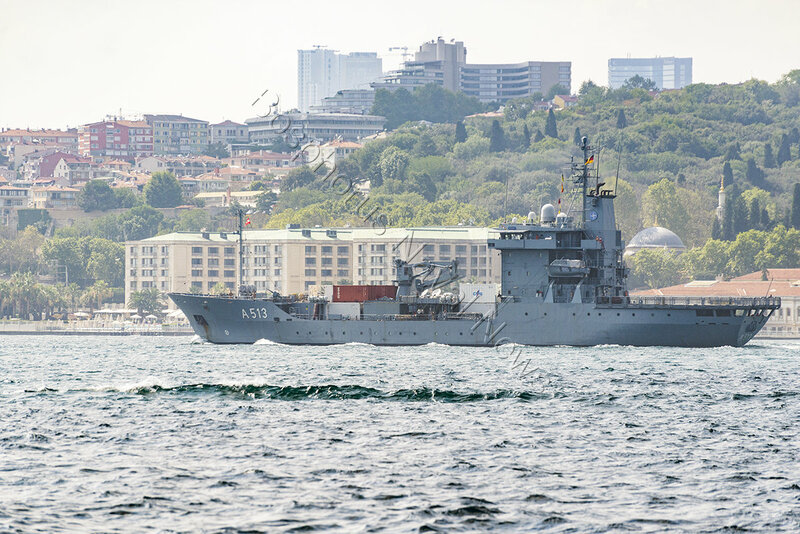 Turkish contribution to Standing NATO Mine Countermeasures Group Two, TCG Anamur making her southbound passage through Istanbul as the taskforce departs from the Black Sea. A new minehunter will replace her for the future deployment of SNMCMG-2. On early July, flagships of Standing NATO Maritime Group Two (SNMG2) and Standing NATO Mine Countermeasures Group Two (SNMCMG2) HNLMS De Ruyter and FGS Rhein arrived in Bulgarian port Burgas for the Bulgarian led exercise Breeze 2018. Replenishment ship FS Marne of Marine Nationale and Greek fast attack craft HS Daniolos followed them. BREEZE 2018 from 13 to 20 July. The exercise was designed to enhance the interoperability of the participating units and strengthen cooperation by practicing different warfare techniques in a multi-dimensional scenario. Multinational participating forces and their crews will be tested in a wide range of warfare tactics focusing on regional security. Bulgaria as host took part with 16 combat and auxiliary ships and cutters, 2 helicopters and staff of 930 members. Two aircraft of the Bulgarian Air Force and units of the Land Forces were also involved in the exercise with most ships. 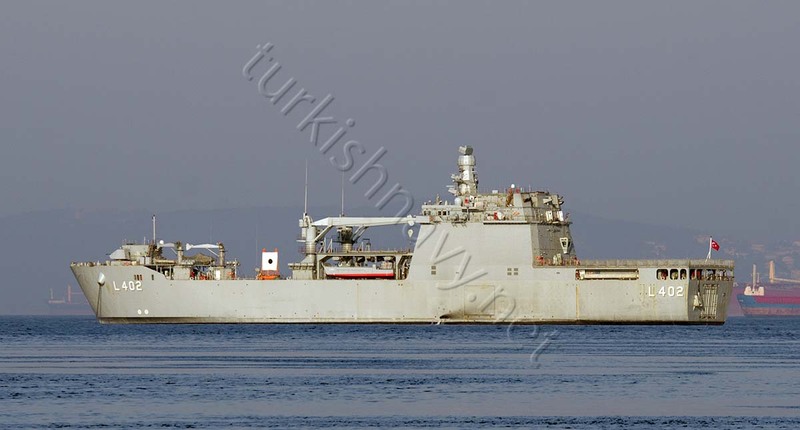 Turkey was the second largest contributor to the exercise with TCG Fatih for SNMG-2 and minehunter TCG Anamur for SNMCMG-2, submarine TCG Gür, fast attack craft TCG İmbat and one patrol plane. In total 25 combat and auxiliary ships and cutters, 1 submarine, 4 aircraft, 5 helicopters and 2,340 service members from the navies of Bulgaria, Belgium, Greece, Germany, Italy, Poland, Romania, the USA, Turkey, France, the Netherlands took part in the exercise, which was held from 13th to 20th July. Following the conclusion of the exercise Sea Breeze Greek fast attack craft HS Daniolos and French replenishment tanker, FS Marne exited the region while the remaining ships of both NATO Standing Maritime Groups made a port visit in Odessa between 23rd and 25th July. During this port visit, the warships were warships were open to the public. According to the Turkish Navy, TCG Fatih and TCG Anamur have hosted 2413 visitors for 6 hours when they were open to the public. After the port visit, all NATO warships conducted a passing exercise (PASSEX) with Ukrainian naval forces. The flagship of the Ukrainian Navy Hetman Sagaidachny and warships Berdyansk, Vyshgorod, Kremenchuk, Lubny, and Pochaiv also took part in this PASSEX. Upon leaving Odessa, NATO naval task forces separated. While SNMCMG-2 sailed towards Constanta Romania to conduct mine warfare exercise with Romanian Navy, SNMG-2 sailed to Samsun Turkey. On the first day of August 2018, both HNLMS De Ruyter and FGS Rhein departed from the Black Sea ending their deployment in the region. Earlier this week, both NATO Standing Maritime Groups made a port visit in Odessa, Ukraine between 23rd and 25th July. During this port visit, the warships were warships were open to the public. According to the Turkish Navy, TCG Fatih and TCG Anamur have hosted 2413 visitors for 6 hours when they were open to the public. Following the port visit, all NATO warships conducted a passing exercise (PASSEX) with Ukrainian naval forces. 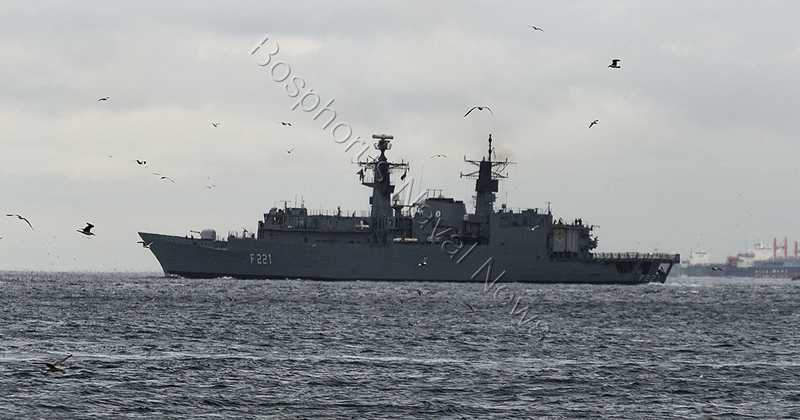 The flagship of the Ukrainian Navy Hetman Sagaidachny and other Ukrainian warships. After leaving Odessa, NATO naval task forces separated. While SNMCMG-2 sailed towards Constanta Romania to conduct mine warfare exercise with Romanian Navy, SNMG-2 sailed to Samsun Turkey. 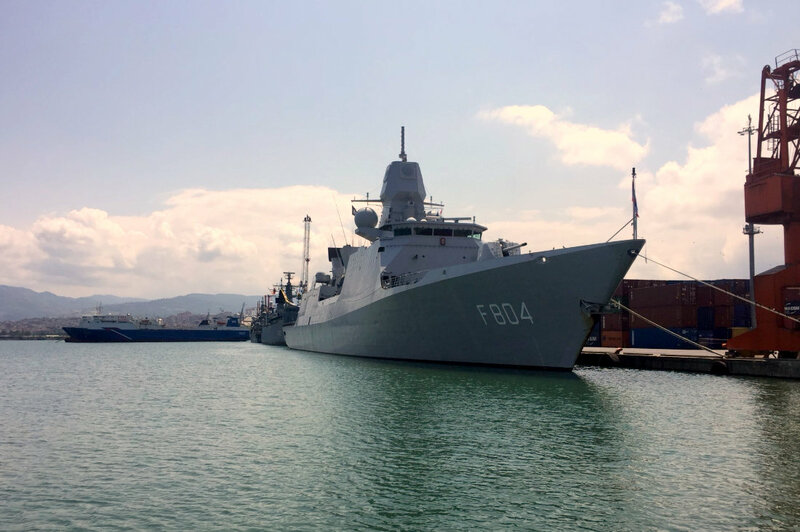 The flagship of the SNMG-2 HNLMS De Ruyter, TCG Fatih and Romanian frigate ROS Regele Ferdinand have arrived in Samsun on 28th July 2018. ON 28 July they were open to public. The ships will leave Samsun on 30th July and will sail to Istanbul to exit The Black Sea.